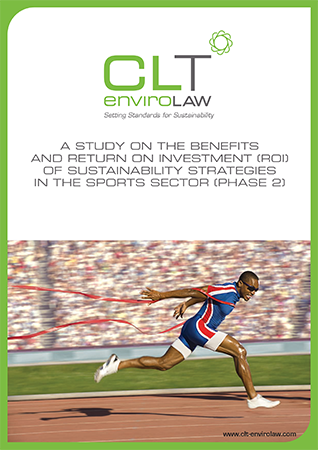 In 2014, CLT envirolaw conducted a pilot study among eight sporting venues, assessing the drivers and barriers to the implementation of diverse sustainability strategies, and their associated beneﬁts and costs. While the study generated considerable interest amongst those organisations surveyed, and more broadly, it was determined that further investigation would be necessary for a more comprehensive assessment, with additional respondents needed to improve the quality of the sample and the credibility of its ﬁndings. On the basis of this determination, a second study was recently carried out as an extension of the pilot phase – one intended to move beyond the limitations and resource constraints of the initial research in order to generate a more reliable database, and a deeper discussion of all aspects of sustainability in the sports sector.